Skin: Evermore. Alice (Pearl Tone) @The Seasons Story NEW! Makeup: .ARISE. The Cross Eyeshadow @The Cosmetic Fair NEW! Nail: The Plastik :[P]:- Nailpolishes – Cathedral @Memento.Mori NEW! Hair: tram G0117 hair / FATPACK NEW! Choker: [ abrasive ] Ominous Spiked Choker @Memento.Mori NEW! Outfit: ::UNa:: Nekoto. Gacha @The Gacha Garden (February 1st) NEW! Moth Accessory: DISORDERLY. x .random.Matter. / INFESTED Gacha @The Epiphany NEW! Pose: an lar [poses] The Dollie Series @Memento.Mori NEW! 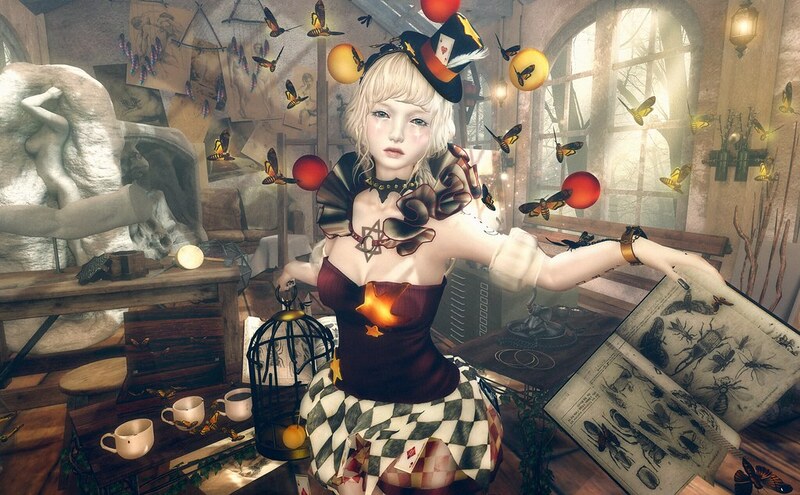 Atelier Set: 22769 – The Art Atelier Gacha @The Epiphany NEW! Terra Decor: The Plastik :[P]:- Terra Gatcha @The Epiphany NEW! Moth Decor: DISORDERLY. x .random.Matter. / INFESTED Gacha @The Epiphany NEW!